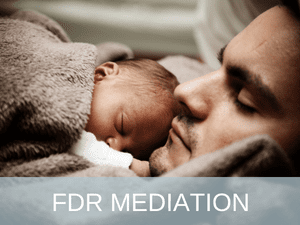 In this section you can find out more about the cost of FDR Mediation (the cost includes Voice of the Child and Preparation for Mediation). There is no charge for contacting the FDR Centre to discuss FDR Mediation or for the FDR Centre to complete an initial assessment of your suitability to participate in FDR Mediation (the ‘FDR Assessment‘). The Government funds the FDR Mediation process for everyone. This may include the FDR Mediation itself, Preparation for Mediation, Voice of the Child, as well as family legal advice. Based on your income and number of dependents, you will be either Fully Funded or Partially Funded. If you are fully funded you are entitled to the government subsidised FDR Mediation service at no charge. If you are partially funded, you will be required to pay $448.50 (including GST). This payment will be required only after you have completed the FDR Assessment (there is no charge for the FDR Assessment stage of the process). How can I apply for full funding? (b) provide proof of income to support your application. Please provide a copy of the completed Funding Declaration Form together with proof of income to your case manager as soon as possible. How can I pay if I am not fully funded? Payment may also be made by credit card by selecting ‘Make a Payment’ below (credit card payment will incur a 2.95% merchant fee). I believe the FDR Mediation process saved us extensive legal costs. Our case manager was wonderful and really quick to help out with any issues.